The basic concept of the Ouija board dates back to 540 BC, when Pythagoras would interpret messages from the spirit world with his student Phlolaus. Ouija is the trademark name for a commercially produced board manufactured by William Fuld and the Parker Brothers Company. The generic term for these divination devices is "talking board". Ouija and talking boards were extremely popular from 1900 through the 1950s. In the 1880s, people commonly made their own boards for use at dinner parties and for a pastime in the home. William Henry Ellington 'Willie' Ellis was a local coachbuilder in Wagga Wagga. He crafted his own Ouija board using a piece of wood, most probably originally the lid of a butter box. The surface was created using pyrography (poker work) which was a very popular hobby during the early stages of the 20th century. 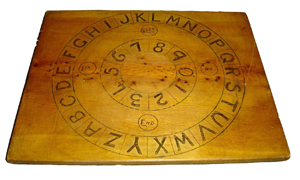 This Ouija board was used by the Ellis family as a means of entertaining their friends and family, and was usually brought out at the culmination of parties held in their home. This is a provocative artefact, which reflects a time when people created their own entertainment and often created the unusual from objects found in ordinary domestic settings. Willie's board provides a hint of an insight into the home life of one of Wagga's well-remembered craftsmen.